Car insurance is a must if you own a vehicle, and you’ll be glad you have it after an accident. But you don’t want to spend a penny more than necessary on a policy, and you shouldn’t have to. By knowing exactly what affects your auto insurance rates, you can figure out how to save on car insurance and get good coverage without breaking the bank. Every insurance company offers special ways to save. To make sure you’re getting all the discounts you’re entitled to, ask your agent to review your possible savings. Traffic tickets and accidents drive up car insurance premiums. If you get a ticket, you may be offered the opportunity to go to traffic school to get it dismissed or reduce the number of violation points that go on your driving record. If you can keep the violation off your driving record, the time spent in class could save you hundreds of dollars over several years. If you’ve got a clunker, it might be time to drop collision and comprehensive insurance, which pay for damage to your vehicle. Collision insurance pays to repair damage to your car if it crashes into another vehicle or object, or flips over. Comprehensive insurance pays if your car is stolen or damaged by storms, vandalism or by hitting an animal such as a deer. If your car is worth less than your deductible plus the amount you pay for annual coverage, then it’s time to drop them. Collision and comprehensive never pay out more than the car is worth. Evaluate whether it’s worth paying for coverage that may reimburse you only a small amount, if anything. If you drop collision and comprehensive, set aside the money you would have spent in a fund for car repairs or a down payment on a newer car once your clunker conks out. Before you buy your next car, check car insurance rates for the models you’re considering. The vehicle you drive affects your car insurance premium, particularly if you buy collision and comprehensive coverage. Safe and moderately priced vehicles such as minivans and small SUVs tend to be cheaper to insure than flashy and expensive cars. You can save money on collision and comprehensive by raising the deductible, the amount the insurance company doesn’t cover when paying for repairs. For example if the repair bill is $2,000, and you have a $500 deductible, the insurer will pay out $1,500. NerdWallet research found that raising the deductible from $500 to $1,000 saved about $200 a year, on average. Our research was based on only two sample states, and savings vary by company, so compare quotes with different deductible levels before you decide. Make all your loan and credit card payments on time. Keep credit card balances well below your credit limits. Open new credit accounts only when necessary. Applying for too many credit cards can hurt your score. If you don’t drive much, consider an insurer that offers a usage-based driving program. These policies base rates in part on how much you drive and, in some cases, how well you drive. To participate, you install a small device in your car that transmits data to the insurance company. You score a discount for low mileage and, with many programs, safe driving habits. Two companies, MetroMile and Esurance now offer pay-per-mile insurance. You pay a base rate for coverage, plus a per-mile rate. MetroMile offers coverage in California, Illinois, Oregon, Pennsylvania, Virginia and Washington. Esurance introduced pay-per-mile coverage in Oregon in 2015. Car insurance rates vary by hundreds of dollars a year among insurers for the same levels of coverage. Get quotes from several companies once a year to make sure you’re getting the best deal. Here are some discounts offered by the four largest car insurance companies. But remember to compare quotes based on your own situation. Just because an insurer offers many discounts doesn’t mean it offers the lowest overall price. Allstate offers some two dozen discounts based on vehicles, coverage options, lifestyle and driving. They range from a 5% discount for setting up automatic premium payments to a 45% safe driver discount. The company also offers Drivewise, a usage-based insurance program, which promises savings of up to 30% for safe, low-mileage drivers. Geico offers discounts for vehicle equipment, driving history and habits, driver training, customer loyalty and membership in one of 500 “affinity” groups, such as organizations and employers. In addition, military members may be eligible for up to a 15% discount, and federal government employees and retirees may be eligible for up to an 8% discount. Owning your home, starting your quote online and signing documents online when purchasing coverage are among the ways you can earn discounts from Progressive. The company also offers Snapshot, a usage-based program that tracks mileage and driving habits. 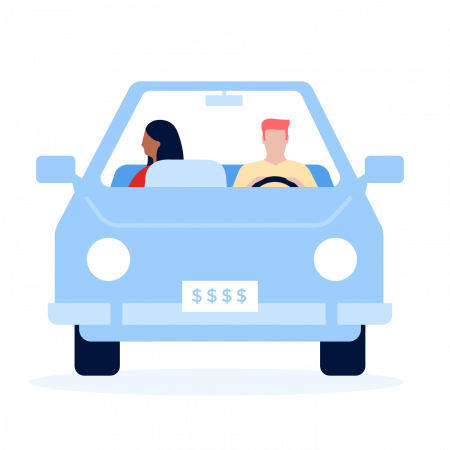 Most customers earn a discount with Snapshot, but some customers may pay higher rates at renewal time if their driving data reveal risky habits. State Farm offers discounts for students, vehicle-safety equipment and safe driving, among others. The company’s Drive Safe & Save usage-based program gives customers an initial 5% discount for signing up. Safe drivers who log relatively few miles can save as much as 50% on car insurance, the company says. The program and discounts vary by state. NerdWallet’s car insurance comparison tool can help you find the best deal.